Feral pigeon control is an essential task in urban areas, where these pest birds can cause huge problems. Not only do they cause a nuisance and carry all manner of harmful diseases, but their droppings can also pose a serious health and safety hazard, too. We take pigeon control seriously at Pest Solutions, so you can count on us to keep these troublesome birds at bay for good. Feral pigeons are an extremely common sight in the UK, being found virtually everywhere that people live. Despite being so common, though, they can still cause plenty of issues for humans, especially when a large group of them decides to make their home on your property. As well as running about and getting under people’s feet, these feral pigeons can also prove to be a health risk. It is easy for diseases to spread through pigeon populations, and that puts anyone who comes into contact with them at risk of contracting these diseases as well. Their droppings can be even more harmful, since not only are they teeming with bacteria, but they are also incredibly unsightly and present a slipping hazard when allowed to build up. 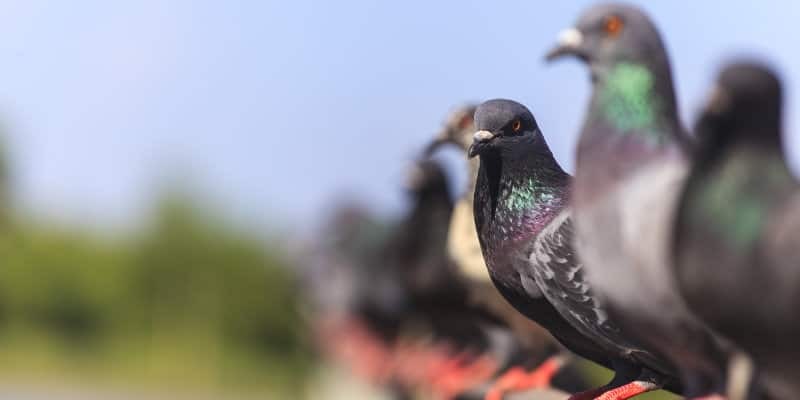 The acidity of pest bird fouling can even wear away the surface of buildings, making a feral pigeon infestation a far-reaching issue that needs to be dealt with as soon as possible. Since feral pigeons are such prolific breeders, it can be extremely difficult to tackle an infestation without the right knowledge and experience. Pigeons make their nests in secluded spots where their eggs will be safe from predators, which means they commonly gather underneath bridges and canopies. Wherever possible, they will also enter buildings too, and in our experience, they are remarkably effective at squeezing through even small gaps in nets or walls. Such a determined pest requires expert pest control to stop in its tracks- and fortunately for you, Pest Solutions provide the results that you need. The first stage of feral pigeon control involves putting down deterrents to stop them from roosting or nesting on your property. Bird nets are by far the most common method that we use for this. They allow our technicians to easily cover an entire area at once and stop any pigeons from breaking through to the other side. We only ever use high-quality nylon nets that can last through even the roughest British weather, and with our pest control service packages, we’ll be happy to regularly check these nets over so that they are always performing as they should. However, while nets are a highly versatile solution, they aren’t always the best option. The area in question might be too small to install nets, or there may be unusual architectural features that would get in the way. In these cases, we have a wide range of additional pest bird deterrent systems that we can use instead. We begin every project with a free, no-obligation survey that lets our technicians come up with the best approach to suit your individual property. For instance, bird spikes can be placed on narrow ledges to keep feral pigeons and other pest birds away. Since they have nowhere to comfortably perch, they will simply fly off elsewhere, leaving your building clean and bird-free. Most of the time, these deterrent systems are enough to handle small or medium-sized pigeon infestations. If the problem still persists, or in cases where there are large numbers of feral pigeons already present, then trapping or shooting may be the best option. Where this is the case, you can rest assured that our trained professional technicians will carry out their job safely and effectively. Our technicians are trained marksmen and licensed air rifle holders, giving you peace of mind that things are being taken care of by the experts. When your property is in the grips of a feral pigeon infestation, it can feel like there is no hope of any respite. However, when you contact Pest Solutions, you can rest assured that we will take care of things for you in an efficient, professional manner. We even offer completely free, no-obligation surveys to show you what we can do and come up with a tailored solution that’s certain to get to the very heart of the issue. With so many pest bird control methods at our disposal, you can count on Pest Solutions to successfully deal with even the most severe feral pigeon infestations. Don’t let feral pigeons take control of your property. Instead, call the experts at Pest Solutions today on 0800 027 2555, and let us restore some order to your home or business. Whether it’s a service call out or a FREE survey, our technicians are always happy to help!